One night all the power of the Earth turns off for a full nine minutes, stopping clocks dead, turning off lights and smashing down to the ground every last plane in the skies. The next day, the power goes off again but this time not to return. This time a white light brings the heavens down on Earth, literally squeezing the ground to the sky, ending life on the planet, ending the planet itself. Except for just a few souls. In the last moments before the end, six individuals are visited by strangers who slap silver bracelets on their wrists, encasing them in a protective bubble or egg, safe to experience the death of the world. These are the Silvers, people who find themselves on a different Earth – similar in some ways and yet so alien in others. On this Earth taxis can fly, food can be rejuvenated, the ghosts of the past can be brought back to life. A group of scientists brings together our six Silvers: insecure teenager Mia, golden boy David, alcoholic Theo, zany cartoonist Zack and two sisters, the Givens, Amanda the nurse and Hannah the actress. They have other names, though – orphan, widow – because that is what they all are. All are bereaved, frightened, shocked and, not surprisingly, together they form a new family, united against this strange novel world while discovering that they themselves are among the weirdest things on it. Each of them has a power, some of which, wrongly used, can kill. As a result, others want to kill or capture them. And when the time comes there is no alternative, they must run, searching for the one man who might bring sense to this chaos and even save them. The Flight of the Silvers is a fabulous piece of speculative fiction. Its opening chapter is completely captivating, introducing Amanda and Hannah in a way that is unforgettable. The great news is that the rest of the novel lives up to its beginning, through all of its 600 glorious pages. Nothing can be relied upon in this strange new Earth, most especially time, and so anything can happen and it does. There are surprises by the chapter and they’re not small ones either. There are as many paradoxes at play here as there are in the juiciest episodes of SciFi TV and there were moments that made me laugh and marvel at the sheer audacity of the twists and turns. Every answer raises at least two more questions. This is an intricately plotted novel and it is also a beautifully written one. Enjoyable wordplay – including the creation of new words and the clever use of phrases – makes The Flight of the Silvers as intellectually engaging as it is fun. Throughout, the narrative grants us intimate glimpses into the thought processes of these six damaged individuals and the result is as much a human story as it is an extraordinary work of science fiction and fantasy. Events and revelations are made harder for our Silvers to understand by the emotions at play. Amanda and Hannah do not have an easy relationship, Mia is uncomfortable in herself and David is an enigmatic stranger even to his own eyes. Each of them is fascinating and very easy to warm to. Zack and Theo in particular have a great deal to cope with and while Zack’s humour endears him to us you just know that often it’s a shield designed to protect him from what has happened. Having to deal with some bizarre ‘superpower’ on top of all this is challenging to say the least. It is impossible not to care for these people deeply and to fear for them. The story moves through a distorted world that is both different and similar to our own. In it move other souls that we get to know and in some cases like, especially Melissa the detective. But there are dark forces at work here while there are others that aren’t so much dark as mischievous and some may be simply deluded. The result is that much of the book comprises a chase across the US, one that is as full of surprises as it is thrills, and all the time our six Silvers have to learn about who they are and where they are going. This is the first in a series and so not all the answers are given, far from it. There are lots of strings for a second novel or more to follow. 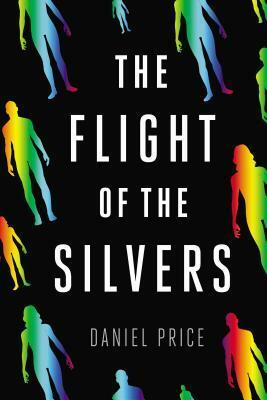 However, The Flight of the Silvers works very well as a standalone novel and has a satisfying conclusion. It’s a substantial book but a hugely enjoyable one and it is extremely difficult to put down. There is no doubt that in places it is bonkers. It’s impossible to tell what will happen next but whatever that thing is it will shock, horrify or delight. The air of foreboding is also chilling. All described and told with the lightest of touches and an exuberance. The Flight of the Silvers is currently available in the UK as an import hardback and it is one that is well worth taking a chance on. I had this as a review ebook but I still had to buy the handsome hardback. Daniel Price is an author to watch and I look forward very much to the second book: The Song of the Orphans. This entry was posted in Fantasy, Review, Sci Fi and tagged Fantasy, Science Fiction on February 4, 2014 by Kate (For Winter Nights). Just wanted to say thank you for the great reviews and how much I look forward to them. Thank you so much! You have made my day! That is so kind of you.